Sometimes the world offers you a saga you weren’t anticipating. It doesn’t come all at once, and you have to be aware of the pieces as they arrive, but when they do, it is magic. About ten years ago, when Molly and Charlie were travelling by car around the U.S. selling wine, they drove through Nebraska along the Platte River just after the huge migration of sandhill cranes came through. The cranes stop along the river to glean the nearby harvested fields in the early spring on their way north to their various nesting grounds. There’s not much else in the area tourist-wise and Molly spent a great deal of time for an entire day reading aloud to Charlie about the birds as he drove. They became obsessed with seeing them. There is a small museum of the sandhill crane just off the freeway, which they visited (worth a stop; it involves locally crocheted and painted cranes). The docent pointed toward the boardwalk out back that led to a viewing area along the river bank and behold! There were no cranes along the river bank. These are big birds – about the size of a great blue heron – all gray and with a bright red head cap. Despite the docent’s assurances, and the guide book’s fulsome descriptions, Charlie and Molly saw nada, zero, zilch. It was depressing after the buildup – and, let’s face it, that stretch of Nebraska is pretty stark. It didn’t seem like much to ask to see a big bird or two, when just days before, there had been thousands. As they drove off, they thought they might have seen a couple in one of the fields along the interstate but they couldn’t be sure. And there the story ended, or so Molly thought. Cut to eight years later, Molly is in Wisconsin in late June selling wine and visiting friends. As they walked along a mowed hay field one day, Molly saw, in the distance, a tall bird she thought was a heron. Her friend assured her that, no, that was a sandhill crane, and that they nested throughout the area in the hedgerows alongside fields like the one they were watching. Fortunately, Molly had borrowed binoculars that day and, for the first time, saw a sandhill crane! Actually, two, a breeding pair. Finally! It was like seeing an old friend. And there the story ended, or so Molly thought. Cut to last September, when Charlie and Molly were visiting Kelly and Ty in Bozeman, Montana. One afternoon, Kelly drove them from Bozeman to the Roosevelt Gate in Yellowstone National Park and on to the Mammoth Hot Springs. 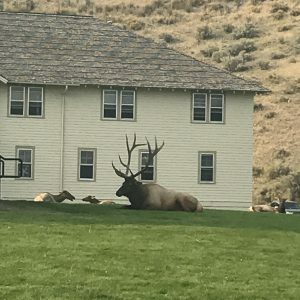 They saw lots of wonderful animals that day – including bighorn sheep, a bald eagle, a huge, 12-point bull elk (would you look at that!) and his harem just outside the park buildings at the hot springs – and, magically, on the way home, several sandhill cranes in a field along the highway, grazing as they got ready to fly back south for the winter. The saga of the sandhill crane may not seem like a big deal but it taught Molly something: Eventually, everything we invest in – no matter how trivial or for what bizarre reason – returns the favor.